Student safety in schools is a critical issue that needs thoughtful dialogue in every community. The Michigan Association of Retired School Personnel (MARSP) understands the challenges of developing potential solutions for preventing violence in schools and that no one solution may be the right fit for every community. MARSP is an organization of retired educators and support staff that communities may look to for local insight and support. Local MARSP members may be good resources for communities that are trying to develop solutions. As with so many controversial issues, community involvement is often the key to addressing difficult issues. MARSP cares about student safety and would like to be part of developing positive solutions to achieve it. Thank you to all of our members who participated in the “All you need is one; one is all you need” referral program in 2017. And the winner of the trip to the Grand Hotel on Mackinac Island is…. According to Gongwer News Service the Supreme Court has unanimously held the state wrongly held back 3 percent of public school employees pay, meaning more than $550 million will be returned to school workers. The order, in AFT v. Public School Employee Retirement System, held the 2010 law that allowed the state to hold 3 percent of the pay for future retirement and health care benefits was unconstitutional. That matches what the court has previously said about the law, but what had remained unresolved was the fate of the money public school employees contributed before the law became defunct. The state had refused to refund it. Any questions members have regarding this matter should be directed to their school district. In addition to winning VISA gift cards, MARSP members who recruit new members will have a new incentive in 2017. 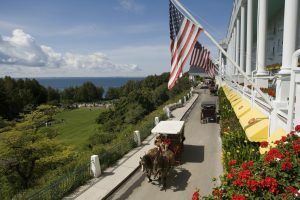 With a theme of “All you need is one; one is all you need.” MARSP is challenging every member to refer at least one new member this year and become eligible to win a two-night stay at the Grand Hotel on Mackinac Island. Members who reach out to potential new members have been MARSP’s best recruiters throughout the years. Those who successfully refer people to MARSP are entered in a drawing every month for a $25 VISA gift card to reward them for their efforts. Now, once a year, MARSP will also give away a free trip to America’s Summer Place, the Grand Hotel on Mackinac Island, valued at more than $2,000. The prize will be an additional incentive for members to help expand MARSP’s numbers. MARSP is 40,000+ members strong and counting, and with more than 212,000 retirees in the state of Michigan, there is ample room for MARSP to continue to grow. If each member recruited one person to MARSP, the organization could double its numbers, effectively increasing its influence with the Legislature in Lansing. Those who have recruited a new member between Jan. 1 and Dec. 31, 2017, are eligible to win. A member’s name is entered into the prize drawing every time he or she refers a new member to MARSP. The more referrals a member makes, the greater his or her odds of winning. The Grand Hotel gift certificate is good through October 2018. Those who want to recruit members but are unsure if they already belong can call or email MARSP’s office and a staff member will provide their membership status.